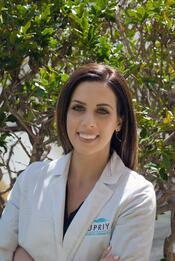 Amanda Sanzone has been a skin care specialist since 2009. She completed her aesthetics training at the International Institue of Cosmetology and received her masters in post graduate skin care training from the International Dermal Institute in New York City. Throughout her career, she has worked alongside the nation's top doctors creating treatment plans to put her patients on a path to beautiful and healthy skin. Amanda has comprehensive experience and knowledge in all major areas of aesthetics, including customized medical facials, chemical peels, Microdermabrasion, Dermaplaning, IPL Photo facials, face and body skin tightening, HydraFacial and CryoFacial. She also offers extra services such as eyebrow and eyelash tinting, high frequency and LED. Amanda specializes in addressing skin conditions such as acne, aging, and sun-damaged skin, and is adept at determining the best course of skin care for patients' unique skin types and individual needs. Amanda is committed to the highest possible level of care. She will make sure that your experience is relaxing, caring, and exceeds your expectations, and will help you look and feel better than you ever imagined. With a full line of treatment options available, Amanda will be able to find the right one to achieve your desired results. See Amanda for a fully customized treatment plan that involves both in-office treatments and a signature product plan that will extend the results of your injectables, lasers and skin treatments, making your skin smoother, brighter and healthier!